During the hot days of summer it’s nice to have some chilled options to cut through the heat. When I’m craving a salad with a little bit more substance I like to turn to some of my favorite grains to make it more of a meal. I threw this together with some vegetables that I had in the fridge so feel free to play with the ingredients to suit your taste. Eggplant and roasted peppers would be a nice substitution. 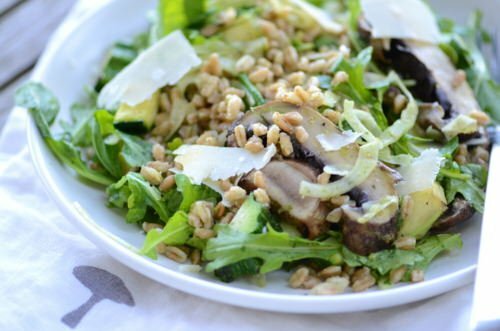 Farro has a delicious nutty flavor and chewy texture that works well in this dish. 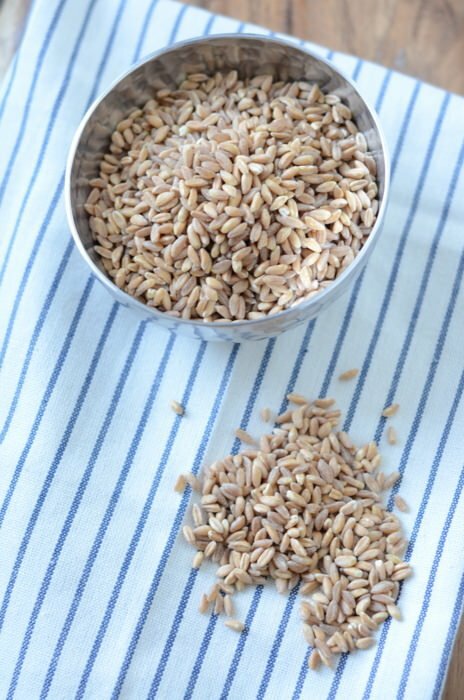 If you can’t find farro, you could substitute wheat berries, spelt or barley but the texture will be slightly different. 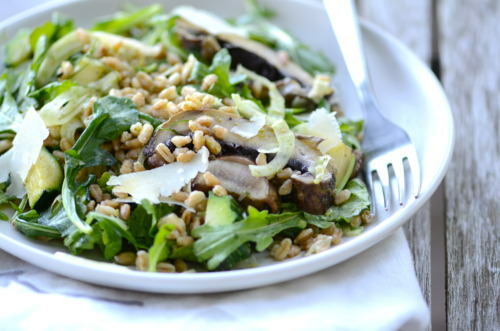 I used quick cooking farro here, so beware that some farro can take up to two hours to prepare. You can easily make this salad vegan by omitting the cheese and adding some olives or capers for that nice salty bite. Combine the garlic, basil, jalapeno and lemon juice in a blender pulse until combined and then slowly add the olive oil until smooth. Take 1/2 of the herb mixture and toss with the vegetables and let marinate for 15 minutes. 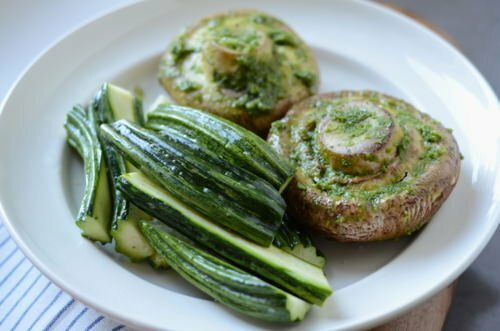 Grill the vegetables over medium heat until marked and softened 6-8 minutes for the zucchini and 15 minutes for the mushrooms. Let cool slightly and then slice the zucchini into coins and the mushrooms into 1/2 inch wide strips. Meanwhile combine the farro and salt in a large heavy saucepan filled with water over medium heat and bring to a boil. Reduce heat to medium and cook uncovered for 15-20 minutes until farro is tender but still has some bite. Mix the farro with the remaining herb mixture and add the grilled vegetables. Toss the fennel and arugula with the lemon juice and olive oil. 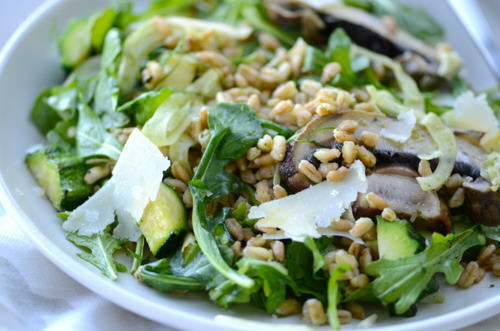 To serve, lightly toss the farro mixture with the arugula salad and shave the parmesan over the top.